Jazkiran is a beautiful Blush & Gold Sikh wedding invitation which will certainly wow your guests. Created in our popular Mademoiselle laser cut design which is beautifully complimented with a stunning regal antique gold contrast. 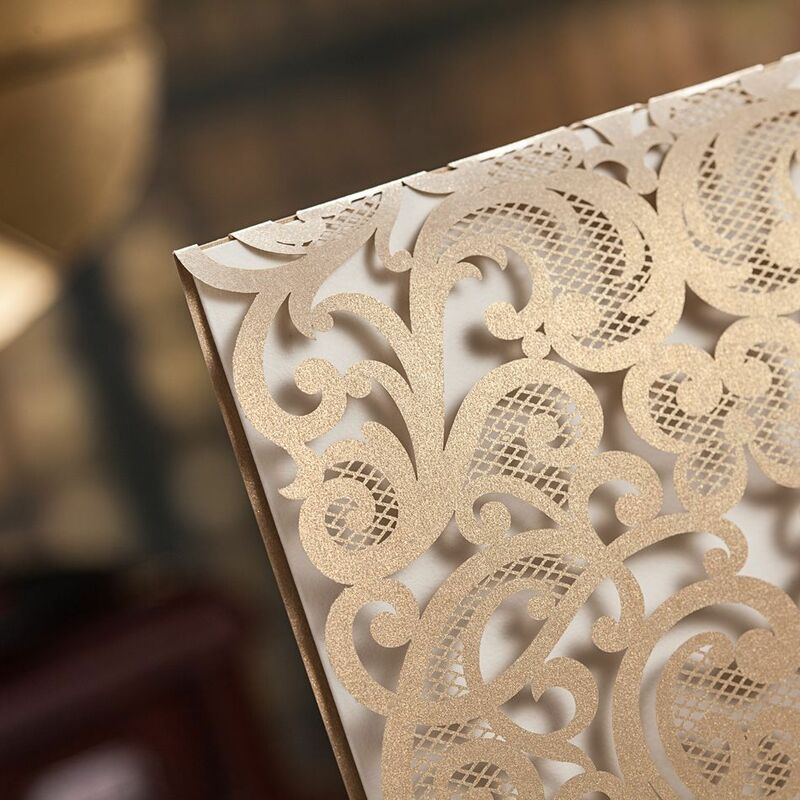 The laser cut invite has a removable gold belly band which when removed will open all four intricut panels of the invite to reveal the inserts or alternatively there is an option not to remove the band but to pull out the inserts from the top panel. Inserts are available as cascading inserts to reveal the titles of events or choose one size for all. The belly band around the invite can be printed with symbols, initials, names or wedding invitation. (As with all religious symbols printed onto invites we request that these are not placed in the bin but discarded correctly when no longer needed) The invitation comes complete with a choice of a ivory pearl paper envelope or a quality card envelope. Matching stationery is available including Table Plans, place cards, menu cards, guest book, RSVP cards, Save the date, Order of service, money envelopes, gift bags and favour boxes. Please contact us to check stock and availability. PLEASE NOTE: Samples are made on request and include 2 inserts without printed text, this is to speed the delivery process of your sample. If you require text please let us know and allow 7-10 working days for delivery.